Here at Maker Ed we’ve been excitedly preparing for World Maker Faire, which takes place on Oct. 1-2 at the New York Hall of Science. We’re organizing some amazing presentations and hope to see many of you there. Christa Flores will be participating in Maker Ed’s “Meet the Maker Educators: Inspirational Stories from the Cutting Edge” talk on Sunday. If you’ll be at the Maker Faire, stop by the Education Stage to say hello, and whether you can make it or not, follow us on Twitter for live updates during the Education Forum and Education Stage talks. 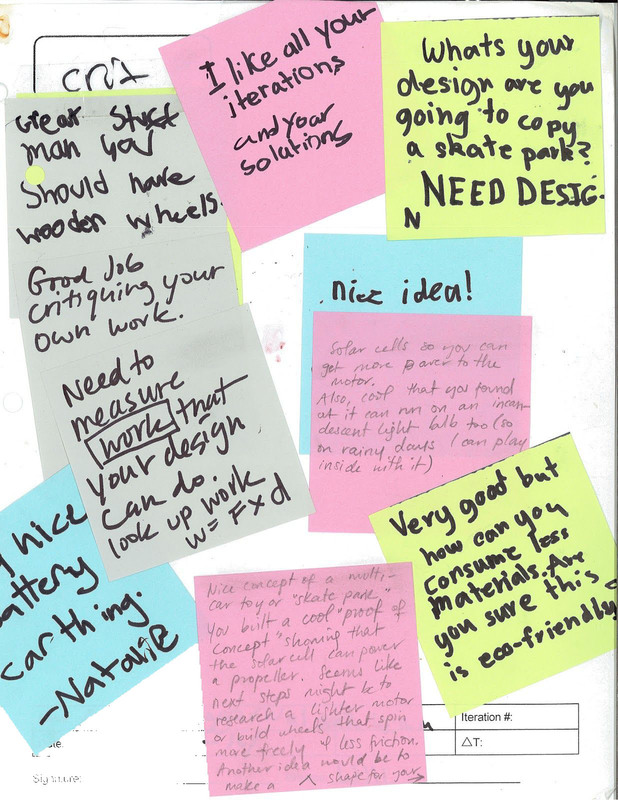 We used post-its to give feedback during our peer critique sessions which students later used for their self-reflections on the process of iteration. My career as a maker educator began the fall of 2012 when I redesigned my science curriculum for fifth and sixth graders to take place full time in a makerspace. It wasn’t long before I had been immersed in a new kind of learning environment that upended all of my traditional ideas of education. I saw empowered, happy, and earnest learners taking on hard problems and proving resilient in the process. I learned quickly to facilitate with enthusiasm and open mindedness rather than sit at a desk or stand at a whiteboard pouring information into my students heads, only to be tested with paper and pencil as evidence of everyone having done their job. We searched the Internet, watched YouTube videos, tinkered and explored together, all the while practicing critical feedback and self-reflection. Assessment became less of a judgement on us as learners and more of a form of storytelling. When sharing work publicly you often hear a learner say, “This is the problem I faced making something, and the solutions I tried,” sharing the story of their individual learning path. Those of us doing the work have vital stories as anecdotal evidence of why making matters. When you hear a student say “I feel smart,” rather than “I got an A on a test,” it resonates very powerfully. “I feel smart” goes a lot further in life than simply figuring out how to please the teacher. To honor the hard work my students were doing on a daily basis, I became committed to telling their stories to a wide audience, not only on social media such as Twitter, but also at conferences and through the use of a blog, and later in the form of a book. In the fall of 2014 a parent became very interested in what I was doing in the lab, and also began to tell my students’ stories using her gift as a filmmaker. In this video, fifth graders celebrate the end of their Patterns unit in Problem-based Science with a school wide public showcase. Traditional forms of affirmation, such as testing, data, and scientific research, are important tools in supporting the use of making in schools. But for too long, we have all assumed that test scores are the only evidence of rigor. Stories about youth learners help portray the full spectrum of diversity and signs of authentic efficacy in maker education. Thanks to readily available technologies, stories can come in the form of images, movies, blogs, public showcasing of work, and more as your creativity allows. Now in my fifth year as maker educator enthusiast, I have learned that when students and teachers share their stories, we co-create the world we all hope to live in. Christa Flores founded the iLab for making at the Hillbrook School (CA) in 2012 and became a Stanford FabLearn fellow in 2014. She now works with a national team of K-12 and university educators to design and research maker opportunities for those traditionally underrepresented in STEM. She is a contributing author to Meaningful Making; Projects and Inspirations for Makerspaces and FabLabs and author of Making Science; Reimagining STEM education in Middle School and Beyond (in press). Contact her on Twitter or by email.